Long before I began the journey of making pens myself, I loved looking at all the different materials & colors available for pens. The pattern of the swirls, the variety of textures, the myriad combinations — all intrigued me. They still intrigue me. I love to get lost in the look of a pen. The materials chosen for one’s custom pen define its identity more than any other component, and so should share equal billing with the nib. With that in mind, I’ve added a new model that offers a broad canvas designed to allow the material to be the star. The new Scroll is a flush barrel pen with a minimalist form, in a shape reminiscent of an ancient scroll. Clean and simple, it features a smooth barrel with slightly indented finials to add a bit of character to the otherwise straight cylinder. The Scroll can be enhanced with the usual furnishings, such as roll stops, clips, ink windows, & decorative bands, or it can be left in its minimalist form. I’ve prepared a few Scrolls to be immediately available on the Pens for Sale page. Check them out! It is that time of year again! The shops are stacked with festive goods, the Christmas trees, lights and decorations are being put in place, and most folks are busy getting ready to celebrate with friends and family. Cozy nights by the fireside, carol singers, kids getting excited… mulled wine and a nice Christmas lunch. Of course, not everyone celebrates now. I do reach a global community. With that in mind, whatever, whenever you celebrate, I wish you peace and happiness. I spend a great deal of time in my workshop, often seven days a week, making orders for customers requiring a special pen. The pens I make are sent to people living in many different parts of the world. I think it rather neat that my work travels far and wide. I love to work with people to make their custom pen a reality. Putting it simply, I love to make all types of pens for you! Scriptorium Pens has a wide and varied range of writing instrument designs, developed with you in mind to suit your many varied tastes. I am generally able to incorporate all the little preferences put to me for each order. A certain design roll stop, a specific sized nib, special materials or combination thereof, even commissioning materials to be made as a special order. It is tempting to sit back and continue to make those pens only. However, I do need to feed my creative urges! Every now and then I get the inspiration and desire to make a pen that is a little different. My creative side comes to the fore when working in my workshop. I wonder what this or that would look like, whether a certain style is possible to make, what materials to use? Often, those desires get pushed to one side by the need to fulfill your pen orders. When I do have a little “me” time, that is rare! You may be surprised to know that I find it very relaxing to be in the workshop, developing a pen I have wanted to make, but not had time to. I do try to take time out during the weekend, a few hours to make an inventory pen or, perhaps, work on one of those ideas in my head. I recently ordered and received shipments of Japanese & German Ebonites. They contain some very attractive colors and patterns, and so make ideal candidates for some of those special pens I have in mind. I’ll be taking a few days “off” for the Christmas holidays, but I’ll still be in the shop. I look forward to finalizing some of those new pen & clip designs during that time. When I start back up after the holidays, I’ll be working on order numbers in the 180’s, making my way through the work queue as quickly as I can, yet still being careful and making sure your custom pen is just right! Enjoy, and thanks to all who have already taken advantage of this offer! 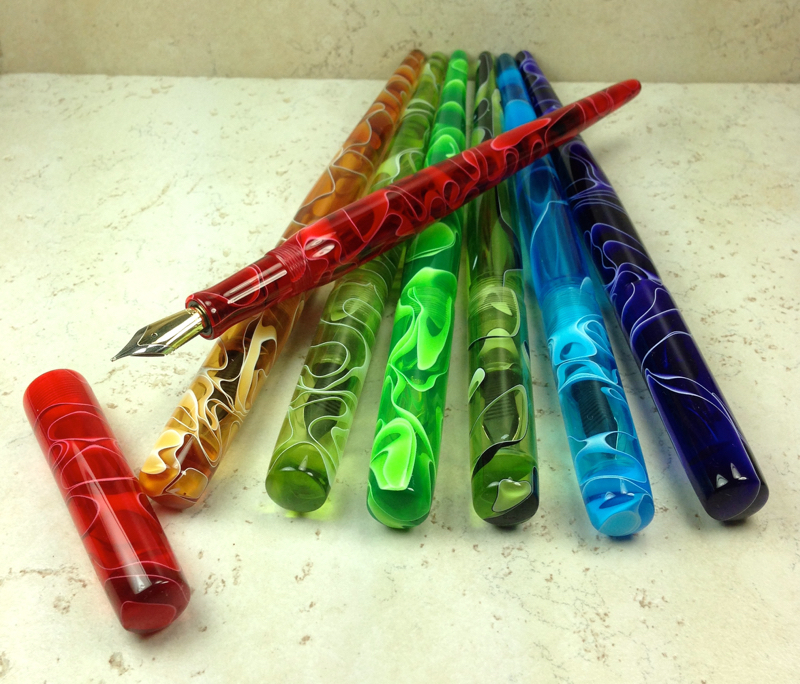 In honor of Fountain Pen Day 2016, all fountain and dip pen orders will receive $15 off the regular price. This offer will last from November 4 until November 5, at 12:00 Noon, Central Time. Recently a customer asked for an Idyll made with one of Jeff Powell’s unique Rotacrylic pen blanks. The special process Jeff uses to create his blanks, including CNC work and double casting, means that the blanks are much shorter than normal pen blanks, so any kitless pen made from them will be shorter than usual. An additional twist was added by the customer in that he wanted the inlaid design to be on the barrel, instead of the usual place on the cap, so that he could see the design while writing. That meant the section and nib had to line up perfectly with the barrel. Finally, the section had to be made longer to allow a standard converter to fit down inside it since the barrel itself would not be long enough to accommodate a converter. The result of all this? A Short Idyll. I’ve got a few more new model designs to add to the lineup, including a pocket pen. A popular new addition to the Scriptorium Pens model line-up includes three new styles of Dip Nib Holders for pointed pen dip nibs. The Epic Dip Nib Holder was created at customer request for a holder that would be about the same length as a regular fountain pen. It measures about 12mm in diameter at the grip and averages around 120mm to 130mm in length. Shortly after the introduction of this holder, requests came in for longer holders in the style of the Literati and Literati Academe Desk Pens. 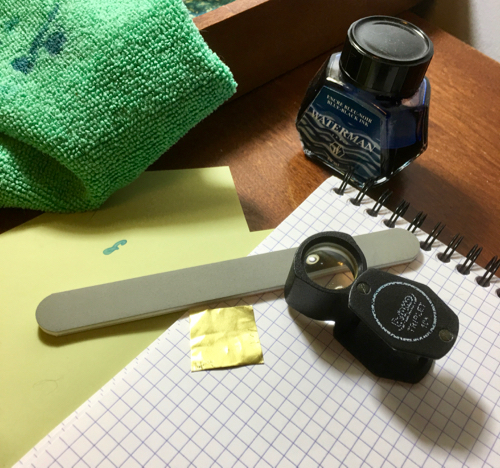 As with my fountain pens, customizations can be added, including metal bands, caps, matching pen rests, etc. Epic holders start at $35, and the Literati and Literati Academe start at $45. In order to get pens to customers more quickly, I’ve upgraded my default shipping from 1st Class to Priority, with the option of Priority Express for those who want their pens even faster. All packages will continue to be fully insured. For more details, see the Shipping page. Customers often ask how to keep their metal pen parts bright and shiny. I’ll now be including a Sunshine Polishing Cloth with all orders that include silver, brass, bronze, or copper furnishings. These soft cloths contain non-scratch, micro-abrasives that quickly restore luster to tarnished parts. Just a light touch is all that is needed. Big Sale — 10% off between Thursday, January 16 & Friday, January 31! It’s time for a sale at the Scriptorium! From Thursday, January 16 through Friday, January 31, get 10% off the regular price on every order. Take advantage of this offer to start the year with a new custom pen for yourself or someone special. Offer ends at midnight on January 31, 2014. If you have previously sent email to the “info” address and got no reply, now you know why! I sincerely apologize for the confusion and miscommunication this has caused. It won’t happen again! 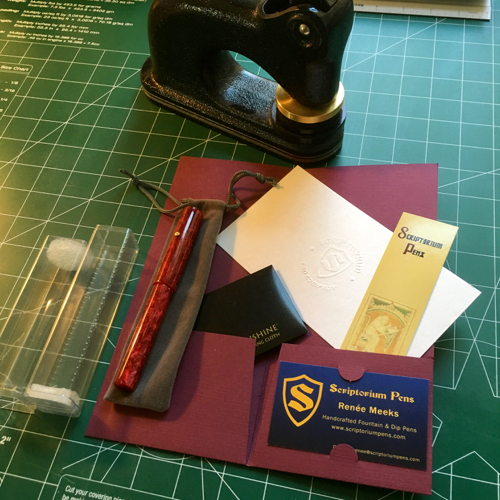 If you have added Scriptorium Pens to your contact list, please check to make sure it has the correct email address. Thank you all for your patience and hanging in there with me while I get this new website running properly!